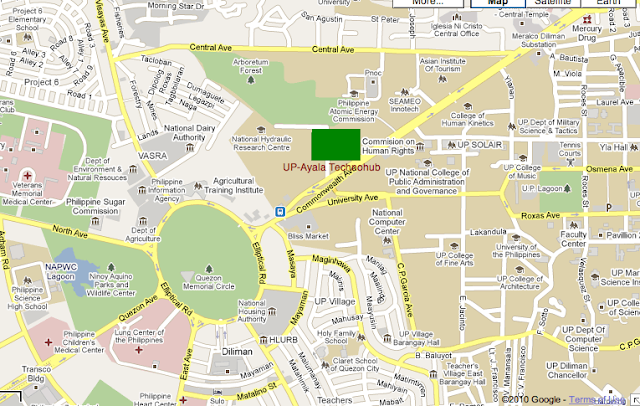 How To Get To UP-Ayala Technohub? The UP-Ayala Land TechnoHub commercial complex, which focuses on information and technology businesses, is still part of the UP-Diliman Campus grounds (the 37.5-hectare North Science and Technology Park) though it's already across the "proper". 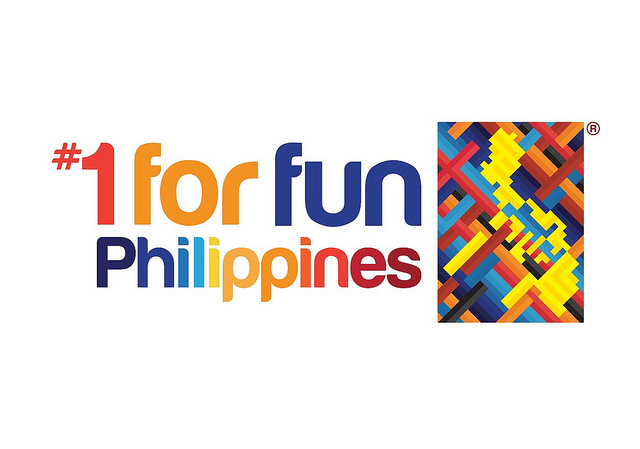 It serves as the hub for huge companies like IBM, Manulife, HSBC, and other BPO centers. The area was developed by Ayala, as suggested by its formal name, and true enough, you will really feel the signature Ayala atmosphere - some say this is a mini-Trinoma but it resembles more of a cousin of Serendra. Restaurants and coffeeshops are present and with the very relaxing open-space environment, one will say that he can stay here for a day! Restaurants and establishments found here are: Yellow Cab, Old Spaghetti House, Flapjacks, Coffee Bean and Tea Leaf, Razon's, Le Ching Tea House, Kanin Club, Gerry's Grill, Mister Kebab, Tokyo Tokyo, KFC, Reyes Barbecue, Seafood Island, Red Kimono, Ral's, Pizza Hut, Figaro, Starbucks, Mercury Drugstore, Timezone, Bench Fix, National Bookstore, Mini Stop, Switch Apple Store, BPI, China Bank, Globe Business Center. Business buildings are also located here like HSBC, Manulife, Ayala Foundation, Inc, IBM, Convergys, Pointwest. Business Centers such as TechPortal, Delta, and Alpha houses a lot of BPO companies. Mezza Norte, Mercato Centrale's "sister" can also be found here every Thursdays, Fridays, and Saturdays 6pm to 3am. If you're an old timer around the QC Circle - Commonwealth Area, you would remember that this is the same grassy space where the Paskong Pasiklab carnival and peryahan was usually situated. Remember that UP-Ayala Land Technohub is along Commonwealth Avenue. The nearest major landmark is Philcoa (a lot of jeepneys and buses passes through this area every day). Nearest MRT station is Quezon Avenue and North Avenue. Option 1. Ride an MRT bound for Quezon Avenue. From here, ride jeepneys bound for PhilCoa or Fairview. Ask the barker or the driver to drop you off Technohub. Be specific with the building as there are many overpass in the area (though they are near each other actually). Option 2. Ride an MRT to North Avenue. Look for the the North Open parking where there are FX traversing the UP-Ayala Land FX route. Option 3. From EDSA, ride a bus that is bound for Fairview or Commonwealth. Asked to be dropped off Technohub. Option 1. Ride an LRT1 (Yellow Line) bound for EDSA-Taft station and transfer to MRT . bound for Quezon Avenue. From here, ride jeepneys bound for PhilCoa or Fairview. Ask the barker or the driver to drop you off Technohub. Be specific with the building as there are many overpass in the area (though they are near each other actually). Option 2. There are jeeps and buses already plying the route of SM-Fairview from the Quiapo area. These will pass by Ayala Technohub already. Option 3. Ride an LRT1 (Yellow Line) bound for Doroteo Jose and transfer to Recto Station of LRT2 Purple Line and ride the LRT2 Purple Line until Cubao. Transfer to MRT bound for Quezon Avenue. From here, ride jeepneys bound for PhilCoa or Fairview. Ask the barker or the driver to drop you off Technohub. Be specific with the building as there are many overpass in the area (though they are near each other actually). If you are coming from Espana or Quiapo, you can ride a jeepney bound for Quezon Avenue and transfer to jeepneys going to Commonwealth. There are also those bound for Commonwealth already so be on the lookout. If you are coming from University of the Philippines (UP), you can ride any of the following jeepneys: UP-SM North, UP-Pantranco, or UP-Philcoa. This will bring you to Technohub. For private vehicles, UP Ayala Land Technohub is along Commonwealth Avenue and very near the Philcoa area in QC Circle. From EDSA, you can go through East Avenue, Quezon Avenue, or North Avenue and take the Elliptical Road until you turn right to Commonwealth Avenue. You will need to take the U-Turn to go to the other side of Commonwealth (where Technohub is located). Be on the lookout for the signs on where you can take proper u-turn. Of course, you can ride a taxicab from any area around the metro and just mention "UP Technohub" or "Commonwealth/Philcoa" and the driver already knows where to go. *photo courtesy of Ayala Land website. 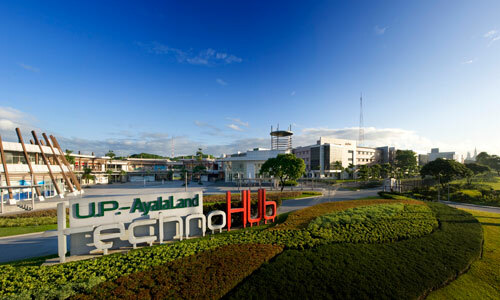 50 Responses to "How To Get To UP-Ayala Technohub?" October 5, 2010 at 4:28 AM This comment has been removed by a blog administrator. this is what i like about people helping other people thru the internet. June 20, 2012 at 8:57 PM This comment has been removed by the author. From Quiapo, there are already Jeeps and Buses (A/C and non-A/C) that ply the route to SM-Fairview. These PUV's will passby UP-technohub so no need to go down Quezon Avenue to take another jeepney. Also not quite sure if the are still present, from Ayala avenue in Makati there are shuttles to UP-technohub. It's the empty parking space between Rufino and Salcedo st. Thank you! We will add this in! How about coming from Pasig area in a private vehicle can I take C5? From novaliches going to technohub? The capability to see how their application will behave Test DPC APK Apk version documents download web links and reveals. We discuss downloading and install experience with mobdro, MOBDRO Mobdro Application Review-- Mobdro APK Download|Most recent Version. Listed below the login type, click on Forgot Individual ID, Password. Discover Credit Card Login The Discover Credit report Card is provided in the United States. I generally want to peruse the quality substance and this thing I found in you post. Compass Claims is a huge name which is providing insurance services in all sectors. Hi guys! How to commute from monumento caloocan going to Up technohub? I need your help asap please. Thanks!